The seed potatoes went in the ground last week and I’m already peering at the field each time I drive past looking for the telltale fuzz of an emerging crop. This is ridiculous. I know perfectly well that it’s going to be nearer to a month before any sign of potato foliage will be breaking through the soil but I am that worst of all gardeners – the impatient optimist. I want action, I want germination, and I want it all now. We’ve sown the same varieties we grew last year, namely purple Arran Victory, floury Golden Wonder and the amazingly versatile Bambino, which has stored and eaten so well throughout the year. It started the season as a waxy new potato and is still now supplying the pub for chips and roasties nine months later having somehow morphed into an all-purpose, almost floury potato in storage. 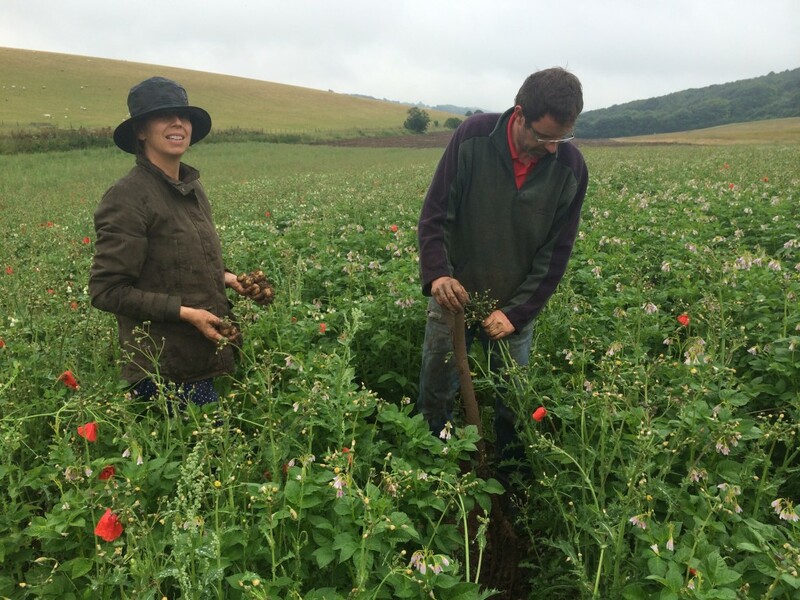 All three varieties come from organic seed, grown organically with farmyard manure kindly and most generously supplied by our organic Sussex cattle. As we don’t irrigate it’s down to the rainfall we get over the next three months as to whether we’ll be harvesting potato bullets or proper sized tubers this summer. In fact, other than earthing up the potatoes when the foliage come up above soil level tomorrow in four weeks’ time, we won’t touch them until harvest. It’s all so different from the conventional arable farming we did 20 years ago when we’d be fiddling about with chemicals and artificial fertilizers most of the season, and lying in bed at two in the morning either listening to the unforecasted heavy rain washing away the expensive herbicide that we had just so expensively applied, or, conversely, the loud stillness of a night where the promised rain was yet to materialize and dissolve much needed fertilizer. Obviously we still worry about the weather but a kind of fatalist pragmatism is the order of the day for the organic farmer. Frustration that you can’t do much to combat the couch grass that is day by day obscuring your crop is tempered by the consolation that fewer, very expensive labour hours are being spent driving fossil fuel inputs in fossil fuel powered vehicles over acres of land often at 10 o’clock at night when sensible people should be in the pub enjoying a pint of Long Blonde or a glass of Picpoul. And yes, poppies really are very pretty when you think about it. Naturally our 1.5 acres of organic crop aren’t going to yield anything like the bounty of the average commercial, non-organic potato farm. Last year we harvested around 7 tonnes of potatoes. The same area sown to a non-organic crop in East Anglia would probably yield about 40 tonnes. But then it has to because the inputs and labour involved in that sort of farming are five times greater. Of course, the potato barons have some natural geographic advantages too, of course. Farming a flat Black Fen of unimaginable fertility, with a topsoil depth close to the earth’s core, feels like an agricultural form of cheating to downland farmers digging their six inches of precipitous topflint. So why are we growing them? Why are we growing this perpetually hungry and thirsty teenager of a crop? Why, when the price of potatoes is at an old time low and many hardnosed commercial growers are thinking of throwing in the towel, are we indulging ourselves in this thoroughly non-economic game of farming roulette? At times last year, when I spent yet another evening post school-run picking up yet another row of tubers, my back and I did question my sanity. But then the little email prompt from the supplier hit my inbox and all of a sudden I was buying another consignment of seed. Am I mad? I suppose I just like potatoes. It gives me a kick to grow a variety – Arran Victory – that was first being dug out of the ground by land girls wearing shocking things called trousers. I love watching Les and Philip Knight, our father and son contractors, turn up in their red 1970s Massey Ferguson tractor, fasten on our 1940s potato harvester and spin out the creamy spuds from the dark earth like so much white gold. And eight months and six and a half tonnes later I still get a thrill when I pull a particularly large potato out of its storing crate. I plan the eventual fate of many of them as I select them. Dauphinoise tonight? A pre-boiled, twice fried chip with just the right amount of salt? Or maybe this one will be chopped and slipped into a minestrone to simmer away with tomatoes, courgettes and cavolo nero? Roll on harvest, I say. It’s going to be great. Just get a move on.